A second-half blitz saw Peterborough United succumb 3-2 at home to a stylish Blackburn Rovers side. Posh went into the break 1-0 up after Steven Taylor headed in Marcus Maddison’s corner, but the match was turned on its head 13 minutes after the break as Charlie Mulgrew and a Bradley Dack double put Rovers 3-1 ahead. 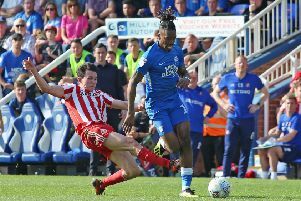 Jack Marriott tapped in his 15th goal of the season in injury time, but moments late captain Jack Baldwin was sent off for a second yellow card after bringing down Dack. The result means play-off chasing Posh have won just once in their last six league matches, although they will come up against few sides as good as this Blackburn one, which has now won five league matches in a row thanks in part to Mulgrew’s fifth goal in four games. The home side made two changes to the team which beat Southend 2-0 in the EFL Trophy, as Leo Da Silva Lopes failed a late fitness test, while Alex Penny was dropped to the bench. In their place came Anthony Grant and Steven Taylor. Any latecomers to the match would have been sorely disappointed as both sides attacked from the opening whistle. Baldwin playing at right-back was booked in just the third minute for bringing down Craig Conway, and the resulting free-kick came out to Richie Smallwood whose cross from the right was headed over by Dominic Samuel who should have scored. Marriott shot over at the other end, but it was Rovers who looked most likely to take the lead. First Dack volleyed wide from Samuel’s chest down, then the attacking midfielder forced a good save from Bond with a shot. The rebound came out to Dack but his close range effort was blocked by a combination of Bond and Baldwin. From the corner Posh broke through Anthony Grant, with Maddison winning a corner down the right. The winger took the set-piece which he sent to the far post where Taylor was there to head in from just a few yards out. The game settled down after the goal, with neither side fashioning a clear opening for the rest of the half. Chris Forrester, who was one of three central midfielders for Posh in a 4-3-3 formation, was excellent in the first-half, and he played his part in a delightful passing move which started from the right-back position and ended with Marriott firing over from 25 yards. Grant was also impressing again, and he won a free-kick 25 yards out which Maddison hit too close to Rovers goalkeeper David Raya. Rovers’ top scorer Marcus Antonsson was then booked for diving after falling over easily inside the area, but the away side continued to threaten through Dack whose movement forced some good defending from the Posh back four. The last chance before the break fell to Gwion Edwards who stylishly controlled a Baldwin pass before shooting wide from 25 yards. The second-half began with a minute’s applause for Posh fan Andy Mills, the 46-year-old who recently died from a brain tumour. But the applause was soon ringing out in the away end as Rovers turned the match around in three minutes. In the 48th minute Mulgrew was left unmarked at the back post to tap in Conway’s corner, then after Forrester lost the ball in his own half, Dack played a quick one-two with Smallwood before firing past Bond. Ten minutes later and the match was as good as over. A Posh corner went to the back post where Taylor lost the ball, then a rapid break saw Samuel spread the play to Antonsson who teed up Dack to score again. Grant McCann brought on Danny Lloyd for Jermaine Anderson, then Michael Doughty for Forrester, but it was Rovers who looked most likely to score next as Dack’s dazzling feet brought the ball to Antonsson whose curling shot from the left was expertly saved by a diving Bond. Posh tried to get back into the match and after a scramble in the Blackburn area Lloyd went down after appearing to be tripped, but nothing was given. Matters got worse for Posh as Grant went down and a stretcher came out, but thankfully he was able to hobble off with Idris Kanu taking his place. With just a few minutes left Posh created their best chances of the second-half. First Edwards hung up a cross from the right which Lloyd headed over, then from the opposite flank Maddison fired over an excellent cross which Marriott headed straight at Raya. And then in the fourth minute of stoppage time Lloyd squared the ball to Marriott to tap in. But Baldwin was then sent off for a second yellow card after bringing down Dack as Blackburn saw out the final few seconds. Peterborough United (4-3-3): Jonathan Bond, Jack Baldwin, Steven Taylor, Ryan Tafazolli, Andrew Hughes, Jermaine Anderson (sub Anthony Lloyd, 66 mins), Anthony Grant (sub Idris Kanu, 86 mins), Chris Forrester (sub Michael Doughty, 72 mins), Gwion Edwards, Marcus Maddison, Jack Marriott. Substitutes: Connor O’Malley, Ricky Miller, Alex Penny, Lewis Freestone. Blackburn Rovers (4-2-3-1): David Raya, Ryan Nyambe, Paul Downing, Charlie Mulgrew, Derrick Williams, Richard Smallwood, Peter Whittingham (sub Corry Evans, 32 mins) [sub Willem Tomlinson, 46 mins], Marcus Antonsson, Bradley Dack, Craig Conway, Dominic Samuel (sub Danny Graham 77 mins). Substitutes: Jayson Leutwiler, Elliott Ward, Paul Caddis, Joseph Nuttal.